COLUMBIA, SOUTH CAROLINA – Callison Tighe member D. Reece Williams III was on hand to help the University of South Carolina School of Law honor its top mock trial team with an award named in Williams’ honor. The law school’s annual awards day, held April 7, recognizes students who excel in a number of areas, from cumulative grade point averages to top grades in specific classes. The D. Reece Williams III Trial Advocacy Award is one of those awards. It went this year to Monica Bracey and Steven Luckie, both members of the Class of 2015 and the winning team in the USC School of Law Fall Mock Trial Competition. 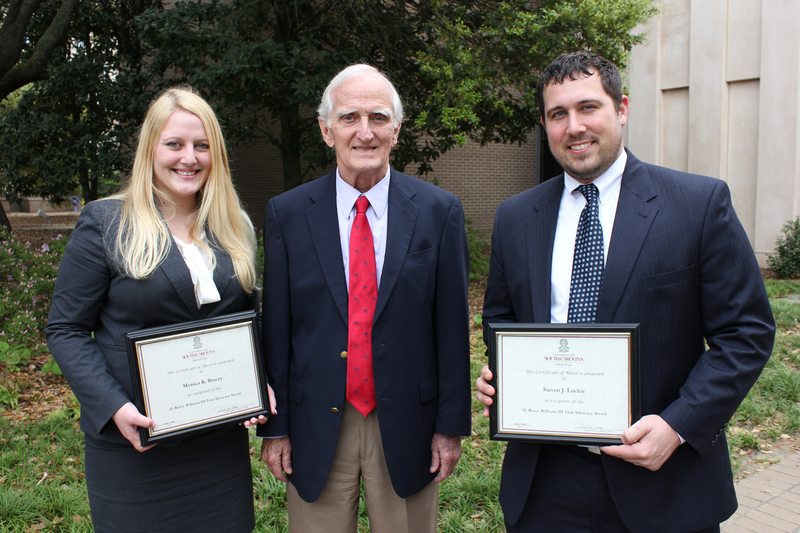 Williams and a representative of the South Carolina Chapter of the American Board of Trial Advocates presented the award, which includes a cash prize as well as an inscribed clock and a permanent plaque in the law school, to Bracey and Luckie. The South Carolina Chapter of ABOTA, a by-invitation organization of which Williams has been a member since 1989, created the award in 2009 in recognition of his service to the organization and contributions to the legal profession. In 2000, Williams served as president of the national organization – the only South Carolina attorney ever elected to do so. He was South Carolina’s Trial Lawyer of the Year in 2006, and he’s a past president of the Richland County Bar. A veteran litigator, Williams often helps teach advocacy skills to other attorneys. He has a long history of commitment to legal education, speaking frequently at workshops and seminars throughout the country. He’s also appeared at dozens of trial demonstrations in a total of 30 states, and he’s taught at the National Trial Academy of the National Judicial College. He’s served as a guest speaker at the USC School of Law, which is his alma mater.